In know Galaxy Dresses are around geeky wardrobes for ages, but I never had one! And even if they grew a tiny little bit mainstream over the years: I love them no matter what. As I found the beautiful galaxy print jersey during a holiday in Los Angeles last summer, I could not resist and wanted to make my own Galaxy Dress. The skater dress pattern is fitting so well to my body type I decided whenever the opportunity appears I’ll ad a new skater dress to my wardrobe. And finding this great galaxy print in downtown LA – the Galaxy Dress will be my first self-sewed fashion dress ever – cosplay somehow doesn’t count for me, when it comes to fashion, how strange is that. Let the sewing begin! 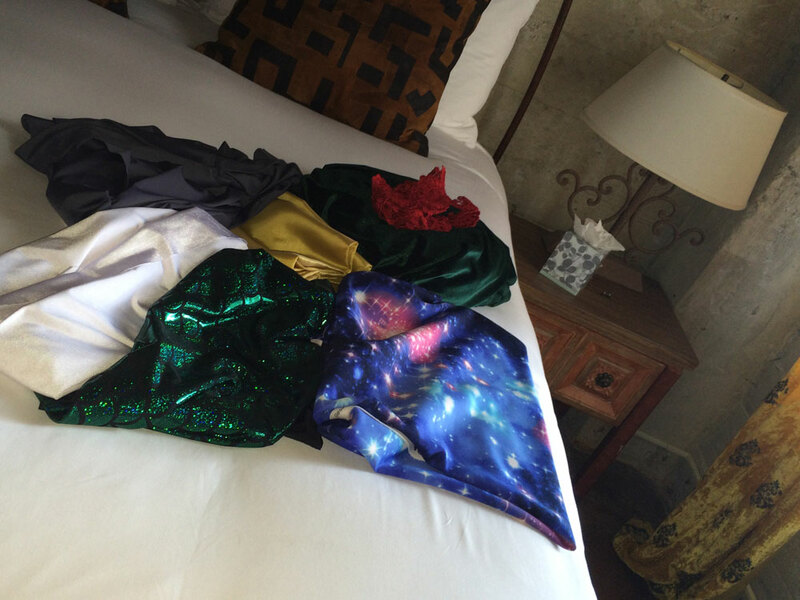 Fashion District is a magical place btw, this is all fabric I bought – and felt like a thief! The fabrics there were really really cheap, everything under 10 bucks/yard. If I had a spare suitcase I’d have bought way more! And of course you’ll see some more fabrics I want to turn in skater skirts and dresses soon here on my blog. Back home in good ol‘ Germany I made a pattern for my galaxy dress. For the top I used a tank top that is fitting well and for the skirt I created a quarter circle. Note: I bought just 1 yard, cause I first planned just to sew a galaxy skirt and the decided I want a dress. 1 yard is very few for a dress – better get moooooore fabric! One can’t have enough fabric anyway. My Galaxy Dress was the first sewing project for me using jersey fabric for a real piece of fashion. 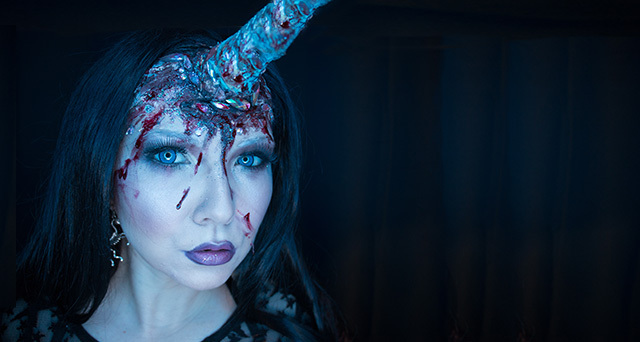 Costume parts are a little different to me. So I had another premiere: For getting a flexible seam that works with the elastic jersey fabric you do not only need an overlock stitch, but also a twin needle. The double seam helps to keep the fabric elastic as well as the overlock stitch. 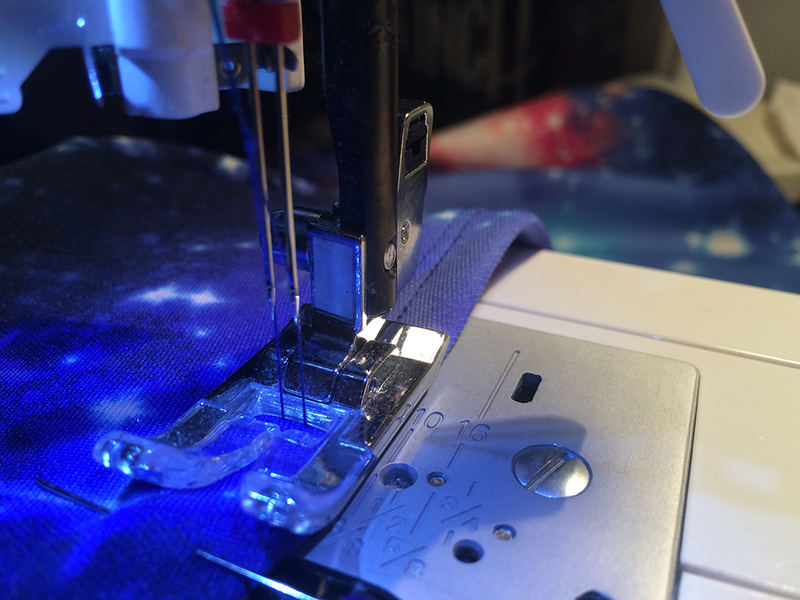 If you don’t have a overlock sewing machine at hand you can also use the zigzag stitch of your normal sewing machine. Some newer sewing machines also have a overlock stich, just check out, what your machine can do. So, having covered the overlock stitch I had to buy a twin needle. I used it for the first time for my Galaxy Dress project, what left me quite sceptical, if this could work easily, but the twin needle and the second yarn bobbin was installed in a second and I could get started. And how awesome that the seams of my DIY Galaxy Dress are really looking like the seams of things you buy in the store! If you want to have the seam completely perfect it also helps to iron the seam allowance before sewing – frankly: I was to lazy and it looks great anyway, but I didn’t wanna keep the secret. Another thing that really surprised me was, that in the moment you have the fitting pattern and the sewing machine set up with my new best friend Mrs. Twin Needle a Galaxy Dress or better a skater dress is sewed in less than two hours. That was the moment I dediced whenever I see cool jersey fabrics I’ll get me another new dress! I love the idea of having a individual DIY wardrobe at hand plus having the opportunity to make me new dresses in the time of a sunday afternoon. 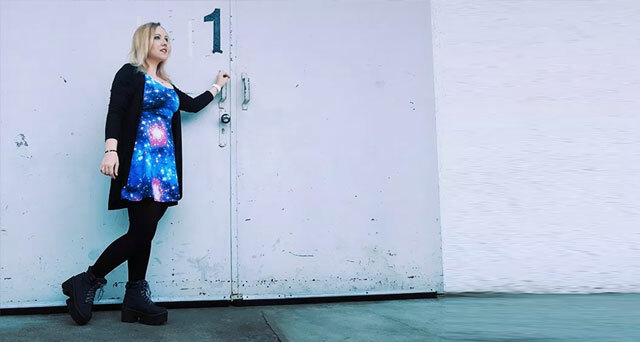 I’m pretty sure my galaxy dress won’t be the last dress or skirt you’ll find here in my blog. If you are interested in the pattern I used or how I made it, just tell me! I can write another blog article dedicated to this topic anytime.